Lights have come a long way since I started bike commuting over 20 years ago. In the mid-80s, I used a 6 watt dynamo to power my incandescent headlight and tail lights, supplementing those with the old flashing yellow “Belt Beacon.” Today, a dizzying array of lighting choices are available for the night cyclist. You can still buy halogen lights, but they might be powered by a hub generator, bottle dynamo, or batteries. I strongly recommend rechargeable batteries, but even here a number of technologies are available: sealed lead acid (SLA), nickel metal hydride (NiMH), lithium ion (Li-ion) and nickel cadmium (NiCad). SLA are cheap but very heavy; Li-ion are pricey but light; NiCad are inexpensive; and NiMH are moderately priced and fairly lightweight and reliable. 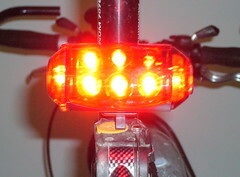 Front lights are typically divided into “be seen” and “to see” lights. “Be seen” lights are the little blinkies. “To see” lights are those that provide a steady beam to light up the road or trail in front of you. Blinkies are appropriate only for well lit urban areas. For night riding, I like having two lights — one set to blink or flash, the other set to a solid beam. The faster you ride, the brighter your light needs to be. While halogen is still a viable option today, the current crop of ultrabright white LED lamps can outshine the 10 watt halogens and rival 20 watt halogens in brightness. While they’re pricey, the higher efficiency of LED lighting translates into longer night-time riding. Off-road bikers like the piercing light created by High Intensity Discharge (HID) lamps, but these lamps tend to be very pricey. The brighter “blinkie” style front LED lamps put out less than 20 lumens. Each typical 55 watt halogen car headlight generates around 700 lumens on the low beam. 6V 3W halogen bulbs are used in dynamo powered incandescent lights. 12V 10W and 20W halogens are very bright bicycle lights. 10W halogens put out about 200 lumens, while 20W halogens generate 400 lumens. I have an older 10W + 20W halogen system with SLA battery for a combined 600 lumens of light which is almost at the level of a single car headlight. I’ve had people tell me they thought I was a motorcycle with this light. My 2 x 3W Princeton Tek Switchback bicycle light puts out 170 lumen, which is about equivalent to the light from a single 10W halogen but with much less current drain. With 6 watts of LED lighting, I’m comfortable riding along at up to 20 mph. While I don’t think I’ll be confused with a motorcycle, the blue-white LED is distinctive and identifies me as a cyclist. These are the red blinking lights, and almost all of them today are red LEDs. Bigger is better, in my opinion. I really like the Cateye LD1000. This rear light, incidentally, also provides good side lighting which I consider to be almost as important as front and rear lighting. Smaller red LED tail lights are often times almost invisible. For tail lights, I think surface area of the lens plays a large (ha ha!) role in the visibility of the lamp. Another factor to keep in mind is battery life. The manufacturers all claim dozens of even hundreds of hours of battery life are possible with their LED blinkies. While the light does continue to operate, the light output is often so dim that the light is almost invisible in traffic conditions. Remember, your little light is competing with bright lights from cars, trucks, motorcycles, signal lights, street lamps, and illuminated business signs. Seen through the haze of a filthy and gravel-pitted windshield, your little light gets lost. It’s a good idea to recharge your batteries at least weekly. Hokey Spokes attach to the wheel spokes and can be programmed to created images and text as the wheels rotate. I’ve seen them in action and they’re really cool. In in urban environment, I don’t know if they add enough light to overcome the usual lighting from cars and business signage. My goal at night is to look like a construction barrier or something else that would be painful to hit. When I lived in snow country, I aimed to look like a snow plow at night. To this end, I use a yellow Lightman xenon strobe that I strap to the back of my messenger bag. This is a xenon strobe, the same kind of electronic strobe used for camera flashes and dance lighting. I like the Lightman strobe because it’s fairly lightweight, comes with a number of mounting options, and is very sturdy. Xenon strobes eat batteries quickly, so rechargeable is highly recommended. I’m also a believer in passive reflectors. I use reflective ankle straps and put reflective tape on my helmets, on my frame, and on my bags. My commuter bikes have the CPSC spoke reflectors. Mounting options: will they work with your oversized handlebars or oddly placed stays? Water resistance: Even the ones that claim to be weatherproof aren’t necessarily after a month of continuously, daily usage in the rain and snow. Button exposure: Depending on how you mount your light, consider how the buttons might be pressed. For example, the button on the Cateye LD500 is difficult to press when the light is mounted on my Blackburn rack. The buttons on the side of the LD1000, on the other hand, are too easy to accidentally push, meaning a discharged battery at the end of the day if the light comes on after leaning your bike against a wall. Construction: I’m brutal with my gear, but the only lights I’ve had any real problems with are the (no longer sold) Serfas WhiteLED and RedLED. They’re great looking lights and very bright, but they’re also cheap junk that don’t last longer than a single season of use. When I visit Interbike in two weeks I hope to review as many lights as possible. I know we have some Dinotte fans here. What kinds of lights do you like, and what should we avoid? Yep, I like DiNotte. I have one of the first Ultralight 5W lights, and it’s served very well. Small, lightweight, 120 lumens. It’s bright enough for my commute, but the battery life isn’t the best. I’m thinking I will buy the new DiNotte 600L this year(which is the upgraded 500L–so I’m thinking it must have 600 lumens) and have DiNotte upgrade my 5W to 200L status(200 lumens) and make that my helmet light. As for taillights—I’m of the belief that more is better. I have a Planet Bike Superflash on the blinkie strap of my Bell Metro helmet, one on my Carradice bag, a BLT Super Doppler DX taillight on the right seatstay, and a Flash Flag on the left. If I’m going to be out in real darkness I’ll also wear my reflective LED vest. The DiNotte taillight is supposed to be the hot ticket, but I haven’t figured out where I’d mount one, and that’s too much battery maintenance. It’s a big enough pain to keep AAs in rotation for the headlight. There is currently a SMOKING deal on the new DiNotte 600L light. Nashbar, in the most recent catalog(number 235, page 15) has the 600L (item number DN-600LI4C) listed at $369.95, down from the retail price of $430.00. BUT—Nashbar is also running a 15% off orders of $75 or more coupon code(1575SPR). I just placed my order. The light is backordered but supposed to be in at the end of September, or earlier. If you want the hottest(no pun intended) light on the market from an American small business–you might want to jump on this one. Like Mike, I am a Planet Bike superflash user. I like mine so much, I just got one for my wife’s bike. They have a kit that allows for mounting on the back of a rack, which is ideal for us. On the front, we use cateye 3-LED, 3-AAA blinkies. We’re not going out in the woods or anywhere that we need high-lumens, and the white blinkies are quite visible (even from the side). I had tried some of the less expensive 2-C battery front lights, and they always broke off after hitting a few bumps. Even the cateye brand one of these broke. It is super important to have lights if you are going to be out after dark, or even if there is a chance that you’re get caught out late. It makes a huge difference, and could save your life! I used to use a pair of Cateye HL530 headlights and a Cateye LD1000 tail light, but I’ve been taking advantage of the Nashbar sale on Dinottes. Now, in addition to those lights, I have a Dinotte Ultra 3 on my helmet, a Dinotte tail light, and a 5W (200 lumen) Dinotte headlight. (It’s not a bike, it’s a UFO!) Yes, that’s 22 AA batteries total. NiMH rechargables are a must! Seriously, I commute on an on-road bike lane for half of my 6.5 mile commute and I figure the way I’m most likely to get killed is by somebody hitting me from behind. Tail lights are more important for avoiding collisions, but I cruise at ~20mph so I need good headlights, too. I wasn’t sure about spending the money for the Dinottes, but my wife said she didn’t want to have regrets about NOT equiping the bike with them if something bad happened. Search the net/forums and you’ll find sites describing how to make bight lights yourself and save a lot of money, if you’re into the DIY scene. I have a 12v gel cell powering a 15 watt yard light lamp with a Radio Shack strobe on the back. There is also a LED blinky and a large reflector on the back, as you can see. Oh, and there is a LED “white” blinky on the front, for back up. It’s heavy, funky, and functional. Here in Reno, the city is pretty well lit, so I don’t worry about the HID or “to see” lights, I have Cat eye	“blinky” headlight and 1 of 2 red “blinkies” out back, depends on me carrying Panniers or not. What I find More Inportand is Reflectors. I carry an old EMT fanny pack as a shoulder bag, reflectors on the back and front of my helmet and chain stays then I have 2 wheel reflectors on my front wheel (strobe effect) and 1 on my rear wheel, then of course jersey and cleats. if you can’t tell I prefer reflects, you can be seen better and you don’t have to deal with batteries. As my “see” light, I like the Princeton Tec EOS ($35-$40) helmet mounted. Very bright 1 watt LED, 3 AAA, and maybe 8hours of runtime. The first light I bought was a Princeton Tec Corona, with 8 small LEDs and an 8 AA battery pack. The runtime was supposed to be something like 100 hours, but that’s only achieved by not actually being able to see anything while it’s on. 3 or 4 AA or AAA batteries should only have a few hour life with LEDs if you’re actually going to see anything with them. I picked up a green Lyte-Wire Kit at a late-night event ride last summer on a whim; recently I’ve taken to threading it through the holes in my helmet, clipping the battery pack to my collar, and setting it to blink mode. It’s not terribly bright, but it does make me look like a UFO and garners many stares from people straining for a closer look at that weird flashing green thing. +1 on the Planet Bike Superflash — incredibly powerful! Great article, Fritz — thorough and informative. The better we light ourselves up (with both active AND passive techniques), the safer we’ll be! Before I entered the world of the bike commuter, I was more likely to spend money on high zoot go fast parts. Now I get excited about high output LED lighting and 3M Diamond Grade reflective tape. DiNotte is offering a taillight that is, from what I can gather—-a 600 LUMENS taillight. It appears to be the 600L(3 5 watt emitters) but red. Wow. That will be almost TOO much on high power, but dimmed to low it should get a week out of a charge. I cut small strips of reflective tape(you can get small amounts cheap from eBay sellers) and put them on the front and rear of my crankarms. The silver tape blends pretty well, and I think the movement of the cranks identifies me as a cyclist to approaching motorists. Rivendell sells velcro wheel reflectors. They’re brighter than plastic reflectors, lighter, and don’t affect spoke tension. I’ve seen people who affix reflective tape to the frames of their bikes, but that doesn’t work when you’re talking about a bike with a nice paint job. Bell is selling a “Safety Orange” version of the Metro helmet. It has daytime visibility, because it’s bright orange, but Bell used helmet straps which are reflective—-and reflective tape is incorporated into the graphics on the helmet. I commute in an urban area so there is usually enough light for me to see by, but I do have a smallish 5-LED headdlight that detatches quickly for use as a flashlight! I plan on adding a helmet light, more to be seen lights (especially lights that will shine on side as well as front/back) and reflective gear. The few times it has been really dark so far cars have seemed to notice me. Man was it scary the first time I was the lead “vehicle” at a stop light! Please don’t run me over! I have a Schmidt hub generator and Busch & Mller lights, the “to see” kind. Over the last two years I can’t imagine having anything else. My main headlight is an LED 1w that turns itself and my rear fender LED taillight on. My secondary lights are a 3w Halogen (I put a switch on my handlebars and use it as a high beam) and a 4d toplight on my rear rack along with the blinkie that came off my Bell metro helmet on my seat post. But with my rain cape covers the seat post light, I think, gets covered. My generator lights work so well I use them a lot, cloudy days and rain too. And I never worry about dead batteries leaving me in the dark. The hub is supposed to have drag, but I can’t tell even with lights off. http://www.peterwhitecycles.com is where I got my lights. Oh, I have reflective tape everyplace I can put it to reflect to the rear. I also have the Dinotte 200L. I’ve been commuting for about 10 years now, averaging about 20 miles a day, and 2 things that I have found that I value the most are reliability and simplicity (weight and ease of putting it on/off bike) of the light. The Dinotte excels at both. It’s super easy to install and remove by simply using a rubber band on the handlebar. I value this since I remove mine at work for security. I’ve used my Dinotte every day for about 9 months. I ride in all weather conditions and it has not effected the light at all, unlick other lights I’ve used in the past. The only small drawback I can think of is the mediocre batter life, which I resolve by having 2 sets of rechargeable AA’s to get me through the work week. I am seriously considering purchasing the 600L from nashbar to get me closer to the light output of a car for the upcoming winter. I just purchased a LIM Arc NiMH with 675 lumens of “Here I Am!” power. Mounted to my helmet for height as I ride a Sun EZ-TAD recumbent trike, it’s quite nice. I didn’t know there were so many street signs that reflected! But then, at 5:30am commuting, that’s about all there are on the road. my wife and I have been using our trusty niterider dual beam lights with the awesome super bright tail lights for ten years now. I have been stopped by motorists numerous times asking where i got the lights. Like so many other cyclists I have determined that it is best to be visible. I did have to rebuild that battery pack this last spring. I commute about 50-60 times a year. I have a 30mile round trip commute all on busy rural roads. Bought a Lupine Wilma 4 LED headlight a couple of weeks ago. It puts out a scorching 830 lumens in the highest power setting, and can be dimmed to 12% (99 lumens) in one or two steps. The first 5 miles of my morning commute (leave at 5:00 AM) are on a very dark paved bike path that runs through woods. The 830 lumens allows for fast riding. With the light dimmed to 12%, oncoming cyclists are not blinded (I asked!). In traffic, there is enough ambient light to see, so I reduce to the mid-level 60% power setting to prolong battery life and LED life. Believe this is the brightest LED light available at this time. It’s not cheap, but the German-made quality is very nice. Compact light head and Li-Ion battery pack. They also have other models with bigger batteries, but for me the lightwight, compact battery supplied provides over 2-1/2 hours of full-power run time. SInce I only use the full power for half the morning run, can get several days from a charge. So far, I’m pleased with this light. MIke Meyers — did you ever get the 600L from Nashbar? I tried ordering and they would not put me on the backorder list. Edd—My 600L is on backorder. I was told Nashbar expects new shipment at the end of September. The price was so good I figured I can wait a while. Just a quick plug for a very bright rear light that I am very excited to own. The Planet Bike BLINKY SUPER FLASH is a 1/2 watt high powered LED tail light that I believe out shines the Niterider hard wired 20 LED tail light all in a compact package. I use a plain resitor driven 10W K2 Luxeon LED torch with a special bike mount. It uses 2 CR123s 3.7V Li-ion’s with intergrated circuit safety. The torch has a 10W setting (30 min) and a 3W (2hrs) run-time and unfortunately no flashing mode. I got the whole package, plus charger with auto-off at the bargain price of.Â£31 from China Quality Goods (hong kong) on ebay. The light is water resitant with o-rings on all the interfaces. I recommend checking it out. I’ve been riding it now about 2 months to work in absolute rain and darkness in the typicle Manchester winter. Cars really notice me, I can see on dark un-lit roads no problem and the charger is small and light enough to pop in a saddle bag, so I take mine with me to make sure I always start with a full charge. Check the actual spec sheet for the lumen data…it depends how you measure it and over what angles you measure, but it’s up there. HID and LED are all nice and stuff, but the light has a pale blue wan quality that just can’t match the eye catching quality of Halogen. I built a 12v system from scratch using 14w yard lights, very bright but light weight as well as they are molded out of lexan, not glass. I have a pair of these up front with an amber xenon strobe off the back. The biggest advantage is that from the front I look like a MOTORCYCLE. I have actually had cars that were in the process of cutting me off come to a stop, and not just a Cal rolling stop either. Now that the days are getting longer and the lights are not as necessary and as I live in a college town, the other problem I have is vacant minded students walking out in front of me who don’t pay any attention when you shout, so now I have a 12v bullhorn siren mounted under my lights that puts out a good 150db wail when I hit the horn button. So far that has avoided 2 collisions and has only been on the bike a couple of weeks. Total cost for parts of my complete system is equal to or less than the cost of a commercial twin headlight system that does NOT include a tail light. And you don’t even have to be all that handy with tools, all you need is to remember which is the red lead and which is the black. Really, this light is looking very amazing.